Every chapter has a lot of people who make it work. Aside from the elected officers there are many behind-the-scenes - people whose efforts and participation make the Red Knights a fun group of friends and a successful organization! Thanks to each of you that helps make the chapter special. 2008 Officers at the fall business meeting and Polar Bear Ride in November 2007. Pictured are Road Captain Bob Shakarian, VP Kevin Martin, President Bob Laford, State Rep Steve Mickle (and past secretary), Secretary Moe Lizotte, and Treasurer Tim Kilhart. Pictured here are new officers of the chapter being sworn in by President Laford at the 2007 Christmas party. Unveiling of our chapter flag celebrating our 25th anniversary as a chapter! It doesn't matter if it is blue sky in the morning or not. Bring your rain gear and plan on getting wet before you are home! The weather outside was frightful... in the days leading up to our Christmas party, and many of us were still without power and had been busy with our communities' storm responses -- but we needed the break and 39 people made it to the Apple Hill Farm where it was warm, the company was a lot of fun, and the food was fantastic! Even Les made it down from the Green Mountain State of Vermont to share the fun! The Brouillet's are definitely the right couple to be ambassadors for the Red Knights! ...look who was one of the first members to dig in! The Roast Beef was great! ...and so was the company. It looks like they marketed a replica of Mark on his HD! A visit to the RKMC Memorial during our Polar Bear Ride. The Brouillet's lay a tribute at the memorial in rememberance of our friends passed. It was 28 degrees at 8:00 but we still had seven bikes show up for our first "Breakfast Club" and ride in October. Bike parking was at a premium because it was a perfect day for riding. 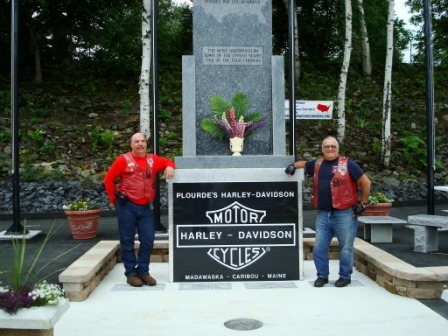 Then we were off to ride west on Route 9, 100 south, and down through the town of Monroe to enjoy GREAT foliage along the Hoosic tunnel, the Mohawk Trail and the Route 116 back to the Connecticut River Valley! Walter R. passing under Old Glory as the Killington Classic Parade enters downtown Rutland, VT.
Records were set during our stop at the Yankee Siege trebuchet! 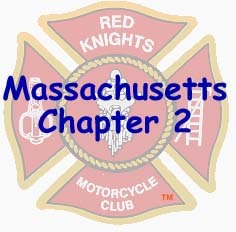 Another great breakfast at the Jaffrey FD -- it was warm inside but a chilly ride up with a temperature of 34! (Past International President) Ed Brouillet presents Mass-2 President Bob Laford with a recognition given by the International Board at the convention in Sandusky for Bob's ten years as International Editor. Is that Bob sitting on an HD? 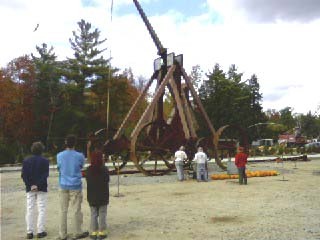 It was a great summer's day when 20 Red Knights met up at the Tully Recreational Area in Royalston for a Labor Day BBQ. Cliff and Steve arrive with the sea food from "Mike's" during our visit to Wells, Maine. One of our "nourishment" stops during our "Porker" Ride. Nearly 200 riders raised over $69,000! 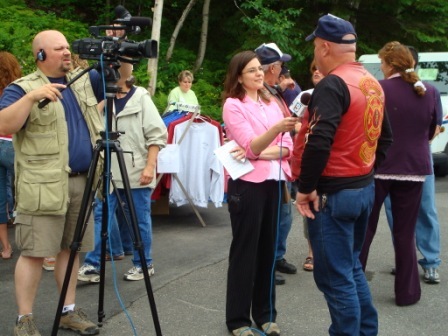 Picking cards at the stop on Pack Monadnock in Southern New Hampshire during our poker run. Tabulating the poker hand results while enjoying an ice cream at Carter Stevens' Farm Stand in Barre. ...after riding with Terry, this is nothing! Rick a top the "highest mountain" and "climbed the highest tree!" ...the approaching "super cell" Thunder Storm. So he directed us to a nearby Race Track and their gazebo was large enough to accomodate us, our bikes, and several other bikes that joined our entourage. We were back at the Swiss Farm Inn along with some friends from Vermont-2! 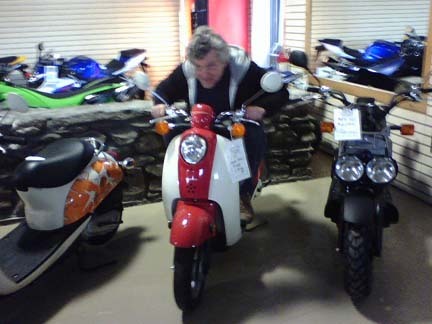 Les B led us around the White Mountains for 250 miles of fun. 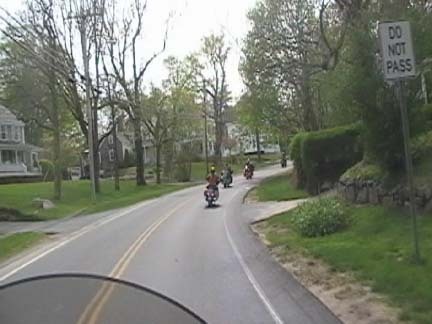 (Here's an article about riding route 100 that was in Backroads Magazine a while ago). Les waited all day for this prime rib at AJ's in White River Junction. Is that a "Black Sheep Squadron" official greeting? ...and it's not just burgers and dogs! Steve and Ed back in their first "corner!" 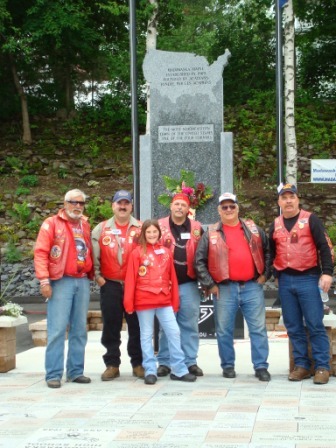 A group of riders headed north to Madawaska, Maine to participate in the dedication of the Four Corners memorial. 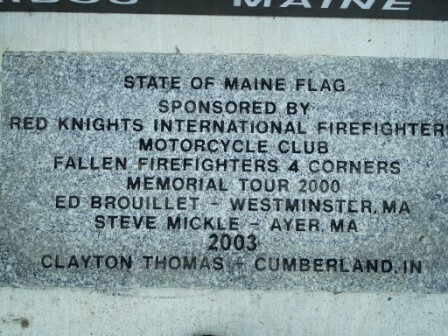 Ed and Steve took on the Four Corners in 2000 in memory of our six lost brothers from the Worcester Fire Department. 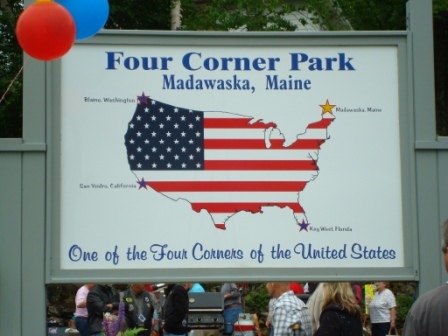 The Four Corners Ride is a timed event to hit the four corners of the United States in 21 days or less. Ed and Steve's quest is still floating around cyberspace and can be read on line. "Can Rick come out to play?" I seem to remember that before their 4-corner tour (in 2000) that Steve was the shy one! The first day of summer... and of course we celbrated with Ice Cream! And on the second day of summer, we again celebrated with MORE ice cream! Thank you to all those who came to Boylston to support Mass-1 during the funeral of Skip Resseguie. 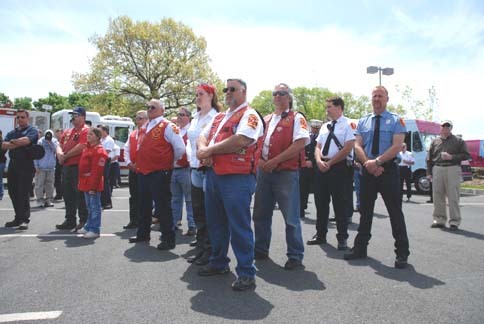 There were nearly 40 bikes from New England and New York with Red Knights and Patriot Guard riders standing in honor for our brother. A stop at the Steaming Tender in Palmer for lunch -- did we mention, it is a GREAT stop for lunch! A stop at the Pelham Overlook on Route 202 - with a view of the Quabbin below. How many repeat stops will there be this year for ice cream at the UConn Dairy in Storrs? Members of Mass 2, 3, and 11 met up at Logan Airport for a tour of the Massport Facilites. It is always a great time when we visit the Cape. 2008 found us back in Eastham -- and even though part of the weekend saw rain we still had a great time. It may be raining outside but there are plenty of ways to keep the laughs going! ...I think those tennis balls will keep showing up all summer long. That's going to be a pretty tight circle. The riding may require some extra layers and heated clothing but that does not mean that we don't make an ice cream stop. Road Capt'ing makes you hungry. Thanks to the ladies of Mass-8 for their efforts in a great dinner after our Cape Cod Grand Tour. Some spaghetti, meatballs, and venison sausage -- as well as s' mores on the fire. Thanks to our Saturday ride leaders -- Chris Olsen, president of Mass-8 and Jim & Lori McGrath of Mass-8. take a look at our fire house stops around the Cape. 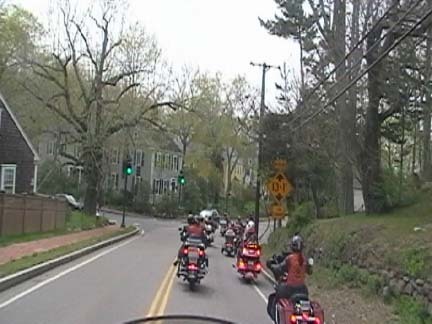 It's been a long winter - so when we met for breakfast on April 19 and found 9 bikes (a few cars) and 19 members, we knew that we deserved that 80 degree spring day and a nice ride around the Quabbin! We got together for a day of parking lot practice to shine up our skills at the beginning of the riding season. Oh! Those poor tennis balls! On our walking tour of Boston... from North Station to the State House, and into the North End for lunch! Taking a look at the wildlife kept behind the bars! Steve (sitting next to Mayor Curly) and acting like a politician with his hand out! Ice skimming at the Lake George Winter Carnival... and some people think motorcyclists are nuts! ...but it also got us out on an early season adventure on wheels with horese power! There was lots to look at when we visited the Boston Bike Show... I think Terry and Dean were looking for divine intervention! And because the Hooters was closed we had to behave and enjoy a great meal at Mother Anna's... and we told them we'd be back in March. Sure... they're forecasting 15 inches of snow for tonight (January 13) but SOMEONE had to let us all know he got out for a January ride before winter returned! I believe that this bike was out on Christmas Day and then again on Janaury 8!